I wrote Sumner off a few years ago due to a highly unfavorable chaff/wheat ratio. I’ve tried really hard to like Beckworth, but these guys simply wallow in confirmation bias. I’ve repeatedly criticized Beckworth at his blog for cherry picking short-term time series data to make his points. Comparing 2013 to ’12 is an example of time series cherry picking used to justify absolutist dogma. He does admit in the end that, “the Fed has failed to restore NGDP to its pre-crisis trend.” but uses this to get in a dig at the Fed for not following his preferred agenda. If you prefer GDP growth, this “remarkably stable” measure [% change YoY] has plateaued at or below the level of troughs in the last 8 recessions, going back to 1960. 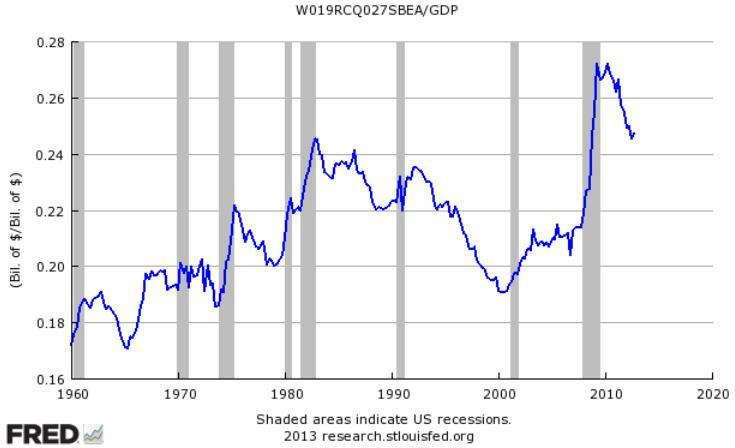 [Graph 2] So, by that measure, this is the most anemic recovery on record. The worst recovery in my life time is pretty dismal success. Plus, wealth and income disparity continue to increase. With sequester looming, I think we’re in for a very rough ride. There are legions of economists who simply refuse to recognize that fiscal policy can make a difference, and are willing to torture data in an attempt to validate this point of view. If you want to make a point using time series data, you really need to consider what is a valid context. Is it this year vs last year, or vs long range historical trends? If you need to cherry pick or engage that ol’ devil denominator to make your point, then your point has questionable validity. I absolutely agree with everything you wrote here (no surprise there eh). Basically what you wrote. The appropriate baseline is other recoveries. I responded at your blog. I am not fighting imaginary MM absolutism. I am fighting very real anti-fiscal policy absolutism. You play a better Sidney Carton than a Charles Darnay. Jazz has his points. Actually he’s looking at fiscal austerity in very conventional terms. It’s not the level of spending that matters but the change in the level of spending relative to trend. The only problem with what Beckworth did is he understated it by only looking at Federal spending, and by not considering that the fact that GDP is itself below trend. Last I checked, G is a part of the GDP formula. It goes up enough, GDP goes up all other elements staying the same. If government spending was doubled overnight, I wonder what every economists would do with their GDP projections. I guess some wouldn’t change theirs, because the FED was not involved. All hail QE!